Introducing the Bacon & Date Pie, Your Pie’s first Craft Series pizza of 2018! This chef-inspired pizza features a base of olive oil, topped with mozzarella, balsamic onions, savory bacon and Medjool dates. 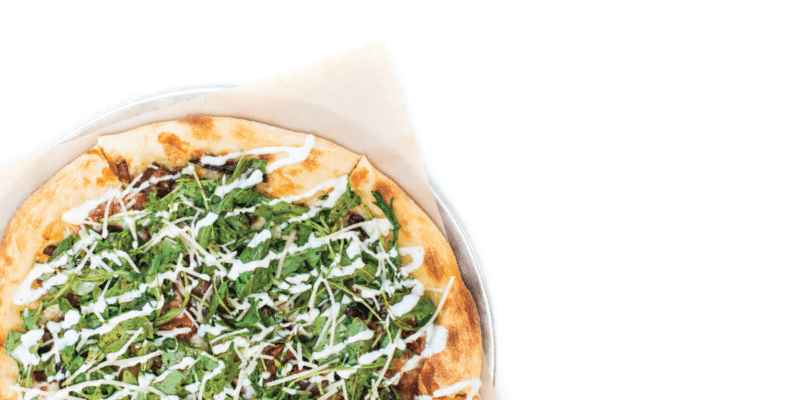 Once baked, the pie is topped with a salad of arugula and Parmesan tossed in house-made balsamic vinaigrette and drizzled with bleu cheese dressing. Like all Your Pie pizzas, the Bacon and Date Pizza is made with hand-tossed dough and baked to order in a brick oven, per Italian tradition. This season, Your Pie will also offer the Bacon and Date Chopped Salad, featuring a bed of spinach and arugula topped with bacon, dates, red onion and Parmesan. The salad is tossed with house-made balsamic vinaigrette and finished with a bleu cheese drizzle. The idea and inspiration for Bacon and Date menu items initially came from Your Pie’s franchise owners in Indio, Calif., the date capital of the world. The recipes were finalized in Athens, Ga., by Your Pie founder Drew French and Culinary Manager Grant Fox. Dates are a sweet fruit and serve as an alternative for guests who like pineapple on their pizza. Suggest guests try Arugula in place or mixed with Spinach, too! Dates also pair well with the following ingredients: ricotta, feta, Parmesan, pepperoni, ham or prosciutto, salami, bacon, onions, or mushrooms. Our special Bacon & Date menu items will only be available for a limited time at your neighborhood Your Pie.